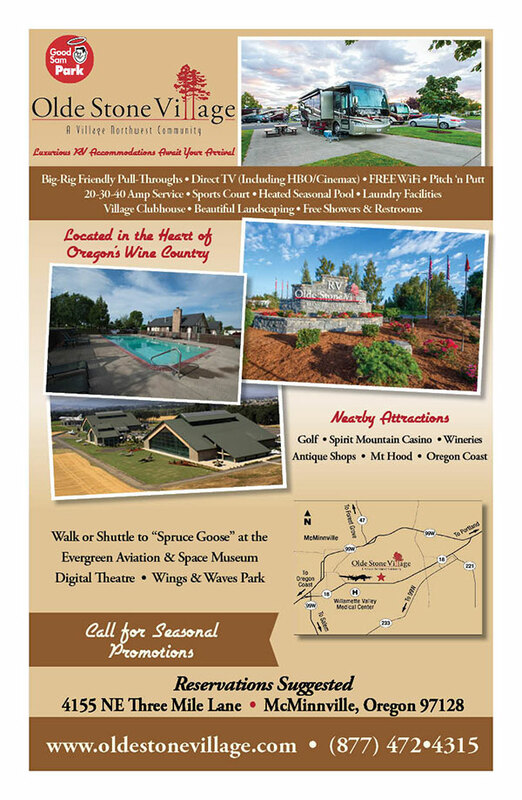 Tree-lined streets and soft grassy knolls are just part of the appeal of Olde Stone Village, McMinnville Oregon’s premier recreational vehicle park and community. Tucked into the rolling landscape of Yamhill County, the park offers easy access to highways, as well as McMinnville’s shops, restaurants, scenic vineyards, historic attractions and roadside produce stands stocked with your seasonal favorites. Widely considered one of the best of its kind in the state, this beautifully landscaped and maintained recreational vehicle park features a complete community center and clubhouse, heated seasonal pool (Memorial Day – Labor Day), children’s playground, sports court and friendly professional managers who live in the Village. Olde Stone Village has been rated by Woodall’s as a Diamond Club recognized RV facility for 5 straight years. Trailer Life/Good Sam Club rated Olde Stone Village 10/10 for the facility, 10/10 for restrooms and 10/10 for overall appeal. Olde Stone Village is a Good Sam Club participating RV facility. Olde Stone Village is big-rig friendly. Olde Stone Village knows how much park services and amenities contribute to the RV traveling experience. They also understand that RV enthusiasts look for a park that has a long list of amenities and facilities designed to make your stay as pleasant as possible. From the level concrete pads and many pull-through spaces to the recently upgraded free Wi-Fi system they strive to provide you everything you have come to expect from a first-class RV park.